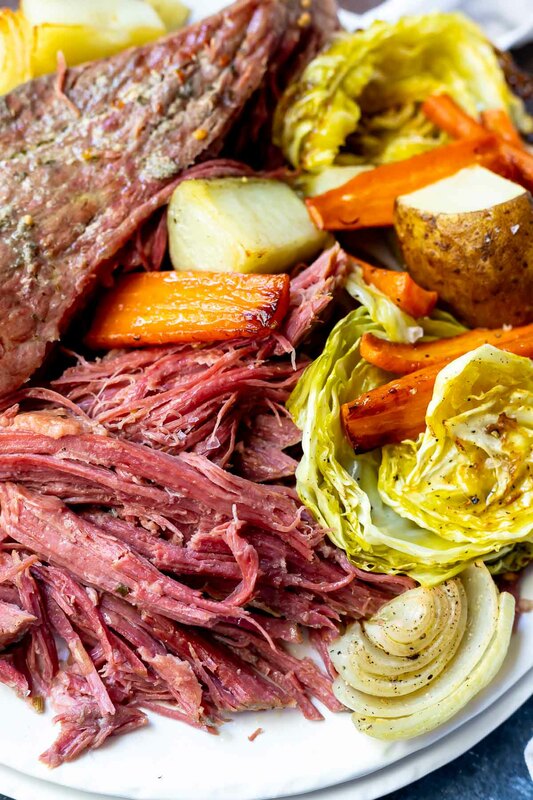 This Pressure Cooker Corned Beef Recipe is a quicker way to get fork tender meat. 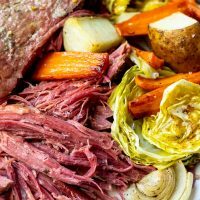 Keeping this meal simple for a traditional Saint Patrick’s Day Dinner made in your Instant Pot. Step 1: Rinse corned beef and place into Instant Pot. Add contents of spice packet and the liquids. Step 2: Pressure cook on high for 90 minutes with a 20 minute natural release. Note: I do not cook the vegetables with the corned beef because I don’t like soggy wet veggies. Instead we are roasting the vegetables when the corned beef is close to being done (before the pressure release). This way we get glorious golden brown roasted veggies to go with our corned beef. Do It…Trust Me. This recipe calls for a 3 pound corned beef which is the average size you’ll find. We are pressure cooking for 90 minutes to get a fork tender texture. If you prefer a slice and serve corned beef, decrease the pressure cooking time by 10 minutes and manual release once done. I have substituted apple cider for the beer and it tastes amazing! Of course, you can always use more water instead of the beer as well. I don’t recommend using broth because any extra saltiness can cause problems. 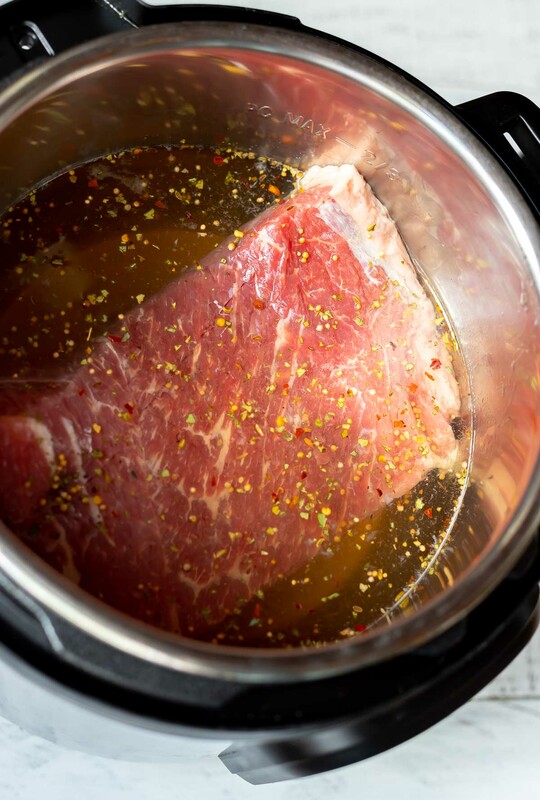 This Pressure Cooker Corned Beef Recipe is a quicker way to get fork tender meat. 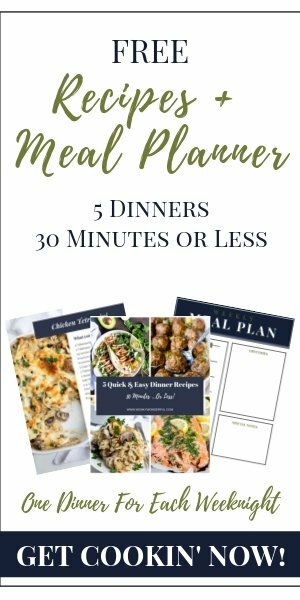 Keeping this meal simple for a traditional Saint Patrick's Day Dinner made in your Instant Pot. 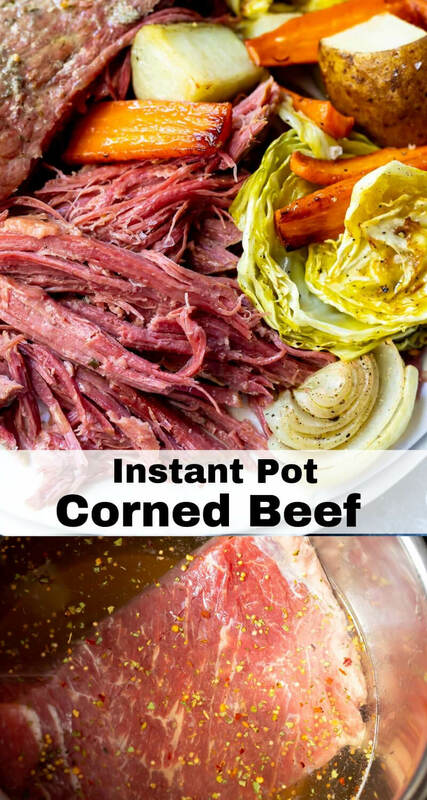 Rinse corned beef and place into Instant Pot. Add contents of spice packet, water and beer. Attach lid and set valve to sealed position. Pressure cook on high for 90 minutes with a 20 minute natural release. Release any remaining pressure before removing lid. Transfer corned beef to platter and pull apart. When corned beef has 10 minutes left during pressure cooking prepare vegetables. Toss veggies in oil and transfer to a rimmed baking sheet. Roast for 25-30 minutes then sprinkle with salt and pepper. Nutrition info is for corned beef only.